Sen. Claire McCaskill (D., Mo.) spent more than $3,000 to bring her private plane along with her on her campaign's May RV tour through Missouri, her latest campaign filing shows. McCaskill's latest filing, which covers her campaign's financial activity from April through the end of June, discloses she spent $20,218.42 to use her plane on the campaign trail during the period, including $3,253 to use it as she told voters she was traveling the state onboard an RV that her campaign named "Big Blue." McCaskill has now disclosed $117,093 in spending on private air travel this cycle. 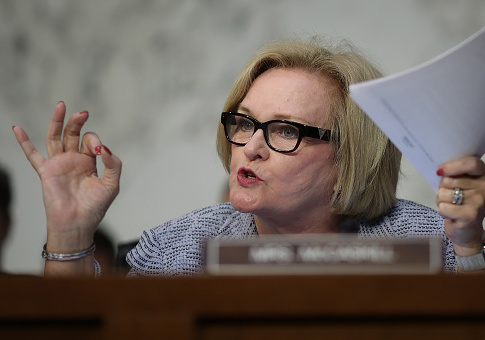 The Washington Free Beacon first discovered McCaskill's plane use during her RV tour by using crowd-sourced aircraft tracking data, which showed her plane following a nearly identical path as the campaign's RV did. McCaskill then confirmed she used the plane, saying she "added some stops with the use of the plane." The campaign payments are made to Aero Charter, a private aircraft management service based at an airport near McCaskill's home near St. Louis. McCaskill reimburses the campaign through in-kind contributions for the travel on her private plane, regarded as the "Cadillac of single-engine prop planes," according to NBC's Brian Williams. McCaskill's latest filing reveals she often reimburses the campaign for luxury expenses that would likely be politically damaging if paid for with campaign funds. Among the campaign costs reimbursed by McCaskill were a May 6 stay at the Beverly Hilton in California for $425 and a June 14 stay at the Loews Regency in New York for $576. She also reimbursed the campaign $255 for her hotel stay at Kansas City's Raphael Hotel on May 29, where she stayed during the RV tour. It is unclear how much McCaskill's campaign spent on the actual "Big Blue" RV used by the campaign. The filing reveals a June 5 $4,999.43 payment to Camper Rentals, Inc. and a June 12 $2,418.97 payment to M.B. Thomas RV Sales for "hardware installation." The senator complained of a "broken door" on the RV. McCaskill's campaign did not respond to a request for comment. This entry was posted in Politics and tagged Claire McCaskill, Missouri. Bookmark the permalink.